This is a meeting for paid-up members of the Bongo Fury owners club. You must be a member to stay overnight, but anyone is welcome as a day visitor. Click here to join the club (opens in new tab). This is the 17th Bongo Bash, and the 16th to be held at the very wonderful Lickhill Manor site at Stourport-on-Severn in Worcestershire. The site is ideal for everyone. 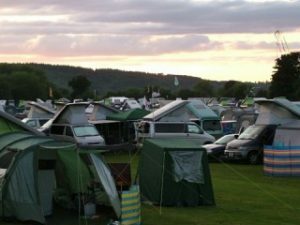 The 14 acre rally field is by the side of the Severn and can easily accommodate 300 vehicles. There are 56 electric hook-ups available, and a further 12 hook-ups for “light” electrical use, such as lighting, kettles etc i.e not suitable for coolboxes, hairdryers or microwaves! All electric pitches are allocated on a first-come basis, so ensure you make your booking early. In past years electric hook-ups have all been sold on the day that booking commences which this year is 9.30am on Thursday 4th April. Electric hook-ups cost £17 per night (£15 for split electric) and you must book a minimum of 3 nights. But it’s June, and you don’t really need to have a hook-up as you can charge your phone at reception; there are 240 non-electric pitches available at £13 per night. There is a children’s adventure playground. The campsite has fishing rights, and small boats can be launched from the slip way. The town of Stourport is a 15 minute riverside walk away, and picturesque Bewdley is 45 minutes in the opposite direction. And it goes without saying that the facilities are top notch. There will be various Bongo related shops on site, as well as a catering unit, a marquee where there will be live entertainment and the club AGM, and a coach trip on Saturday. 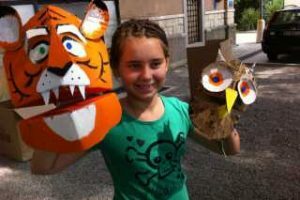 There are also some organised children’s activities, as well as a craft fair and some social events. This is a Bongo Fury members-only event. Not a member? Then join here. Day visitors are welcome free of charge but are asked to make a voluntary donation to this year’s nominated charity. For the very latest updates, discussion etc then have a look on the Bongo Fury Forum. To book for the Bash you must be a paid up member of Bongo Fury. Please have your membership number (or home postcode) and your vehicle registration available when contacting Bongo Mission Control. No receipt will be issued. Information packs will be sent out 2 weeks before the event. Update 19/04/19: All electric hook ups and split electric pitches have now been sold. In total we have 151 Bongos booked for the event. Booking online: This facility is now open to book all remaining non-electric pitches. To pay by credit or debit card click here (opens in new tab). In top box put your membership number of home postcode. The cost is £13 per night. In “Description” tell us which nights you are booking. You can also pay by Paypal by sending a payment for £13 per night to ian@bongofury.co.uk. In the “Add a Note” box tell us your membership number and the nights you are booking for. 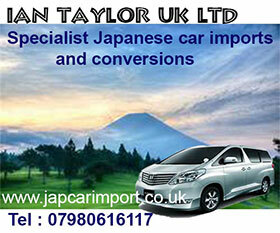 You can also book over the telephone on 0114-2550836 with credit or debit card. Open Monday to Thursday 0930 to 1600. This year’s Saturday excursion will be to the food and drink festival at Droitwich Spa. On the way we will call in at the Jinney Ring Craft Centre for an hour. Coaches leave at 10.45 am and will return to Lickhill at 4 pm. To avoid disappointment book the coach when you book your Stourport pitch. 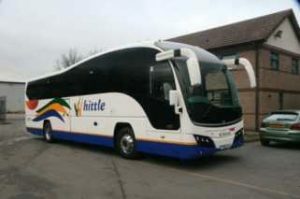 Update 19/04/19: This is a 51 seater and we have taken 31 bookings so far. At the Bash the Bongoland Shop will be open from Wednesday to Sunday lunch time. 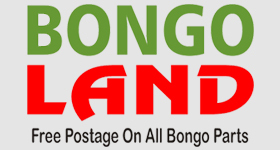 Here you can buy parts and accessories for your Bongo; if you need us to bring you anything in particular please get in contact and we will bring it with us; you will then save on postage costs. Other traders include Bongospares, New Dawn Conversions, Karl Chadwick’s Electrical Emporium of Delights, Glawning, and Bongo Clocks. 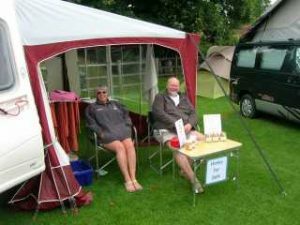 Others, like Jon and Jan (pictured above) set up their own honey stall. If you want to set up your own stall, get in touch, and we will find you an appropriate slot. 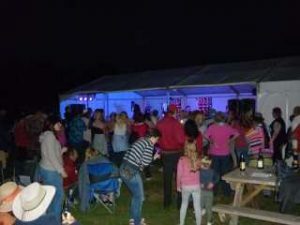 Live entertainment in the Marquee is included in your ticket price. On Friday night it will be the return of STOURPORT’S GOT TALENT. And on Saturday night there will be live music from Cardiff’s Pub Fiction. 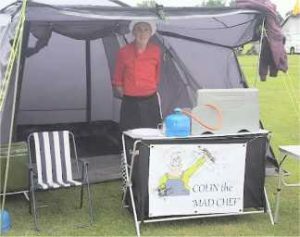 This year sees the return of Blackburn’s own Colin the Mad Chef who will be available to serve you bacon sandwiches, hot dogs, snacks, vegetarian and vegan delights, and evening meals. He never sleeps! Saturday 2 pm to 5 pm Craft Fair. If previous years are a guide there will be wood turners, cake stalls, knitted items, baskets and second hand books. And possibly low coolant alarms! This will be held in the main marquee (Bewdley end of field). If you want to take part there’s no charge, just bring along a table and your goods/displays.